A Tom Colicchio restaurant in the Alexandria Center, Riverpark is an elegant space with a unique menu with plays on the classics. I love the stunning extended terrace overlooking the East River, and recommend visiting while the weather is warm. Riverpark has its own garden outside where many ingredients such as their peppers are grown. The fried chicken & waffles is our favorite dish, due to the unique rosemary-black pepper waffles that have a little bit more punch than the average brunch waffle. Other choices include the BLT made with pork belly, and the Huevos Rancheros with heirloom beans and brisket ends. For a special appetizer, try the grilled bread with house-made ricotta, poached apricots, pistachios, and bronze fennel. Definitely "The Nimble Rabbit," a refreshing mix of carrot, orange, and lime juices, with a touch of maple syrup and club soda. Reservations are accepted for parties of two or more. 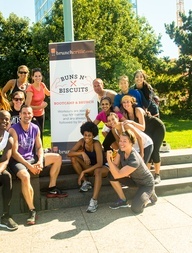 Buns n' Biscuits: A Bootcamp & Brunch. 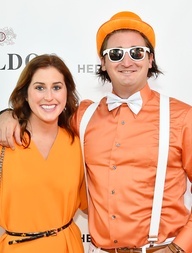 Sign up for the newsletter to be informed about events and brunch highlights.